Allies of Iraq's U.S.-backed prime minister appeared Sunday to have made gains in the provincial elections, rewarding groups credited with reining in insurgents and militias, according to unofficial projections. Initial results from Saturday's landmark voting are not expected for days. But reports by Iraqi media and interviews by The Associated Press suggest candidates backing Prime Minister Nouri al-Maliki had strong showings in the crucial Shiite heartland in southern Iraq. If the indications prove true, it would strengthen al-Maliki's hand ahead of national elections later this year and reflect a shift away from the more religious parties dominating the country. Nationwide turnout was 51 percent, said Faraj al-Haidari, chairman of the election commission. It ranged from 40 percent in the Sunni-dominated Anbar province in western Iraq to 65 percent in the Salahuddin province, which includes the hometown of Saddam Hussein. Final figures were not yet ready for the Baghdad area, but al-Haidari said initial reports placed it at about 40 percent. Al-Maliki's supporters appeared to hold the lead in many areas of the south, including the key city of Basra and the Shiite spiritual center of Najaf, according to Iraq's private Al-Sharqiya television. The trend was supported by voter comments in Basra and other areas. Many voters praised last year's government-backed crackdown that broke the Shiite militia control in Basra and other areas. "Al-Maliki ended the militiamen's reign of terror," said Faisal Hamadi, 58, after voting in Basra. "For this he deserves our vote." Gains by al-Maliki's allies would come directly at the expense of the biggest Shiite party, the Supreme Islamic Iraqi Council, which is a senior partner in the government but has hinted it could make a bid to take the leadership in national elections later this year. The Supreme Council has a strong base among Shiite religious authorities - who are seen with suspicion by some Iraqis because of perceived ties to neighboring Iran and claims they fueled sectarian violence. In the western Anbar province, Sunni tribesmen also are hoping to ride public support for their role in fighting insurgents. The so-called Awakening Councils, which rose up against al Qaeda in Iraq and other factions in late 2006, are credited with leading a turning point of the war. The tribal leaders are now seeking to capture seats on the provincial councils, which control spending, jobs and other important regional influence. Sunnis widely boycotted the last provincial elections in 2005 because of fears of reprisals from insurgents and opposition to the U.S. occupation. The elections took place without serious violence and were hailed as a major achievement by Iraqi officials seeking a return to stability nearly six years after the U.S.-led invasion. But there were widespread reports of eligible voters left off ballot lists. Election officials said they would investigate the claims. 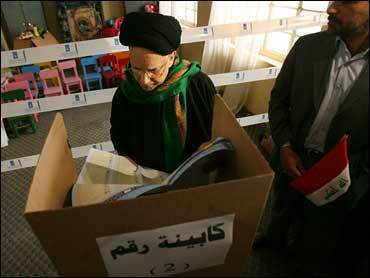 Voting took place in 14 of Iraq's 18 provinces. Elections are planned later in the Kurdish autonomous region and were indefinitely postponed in the area around oil-rich Kirkuk, where ethnic groups could not agree on a power-sharing formula. The U.S. military says an American soldier has died of a noncombat-related injury in the northern Iraqi city of Kirkuk. A U.S. statement says the soldier died Saturday but gave no further details. The latest fatality brings to at least 4,237 the number of U.S. military members who have died in the Iraq war since it began in March 2003, according to an Associated Press count. The figure includes eight military civilians killed in action. At least 3,406 military personnel died as a result of hostile action, according to the military's numbers.